Bizagi supports integration with Identity Management services such as Azure Active Directory (Azure AD) throughout the support for the OAuth 2.0 protocol with the OpenID extension. For introductory information about authentication options in Bizagi, refer to Identity and Access Management. 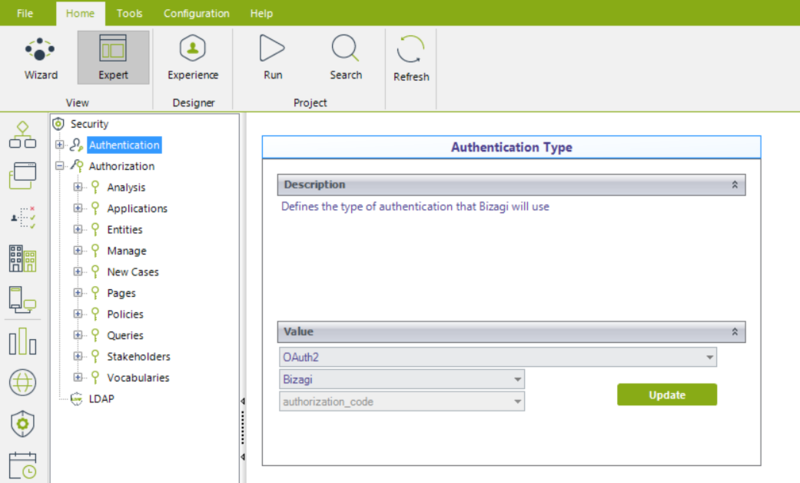 Through this OAuth setting in Bizagi, you may choose to delegate authentication to an identity provider server supporting such standard. Among other identity provider servers supporting the standard, different from Azure AD, you may choose to authenticate against a different Bizagi project you may have. This section describes how to configure OAuth in your Bizagi project, so that this one delegates authentication to another Bizagi project. For the sake of a better explanation on steps, the Bizagi project set to use OAuth for authentication purposes will be referred to as the Client project, while the target one granting access will be referred to as the Server project. 1. Make sure that the Server project supports OAuth. 2. Generate access keys for OAuth access. 3. 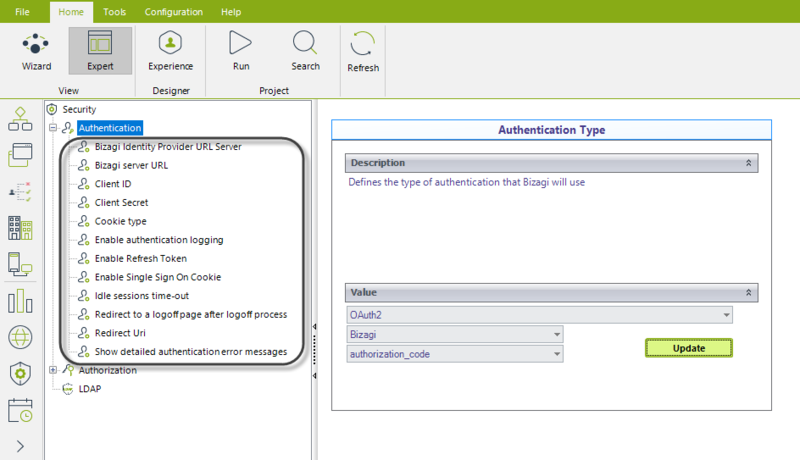 Set the authentication type in Client project, through Bizagi Studio. 4. Synchronize the users from your Server project into your Client project. The steps oriented toward configuring such integration, will require specific technical details (e.g, endpoints, authorized credentials) which are usually managed by an IT admin. Therefore, these steps will require a profile having expertise on this matter, and having access to the information mentioned above. At the Bizagi Server project, you may use any type of authentication. You will first need to make sure that such project was created in version 11.1 or higher, and that such project was NOT migrated from a previous Bizagi 10.x version. 2.1 Register the OAuth application. Click on the OAuth2 Applications option available under the Admin menu to grant access to an external application. 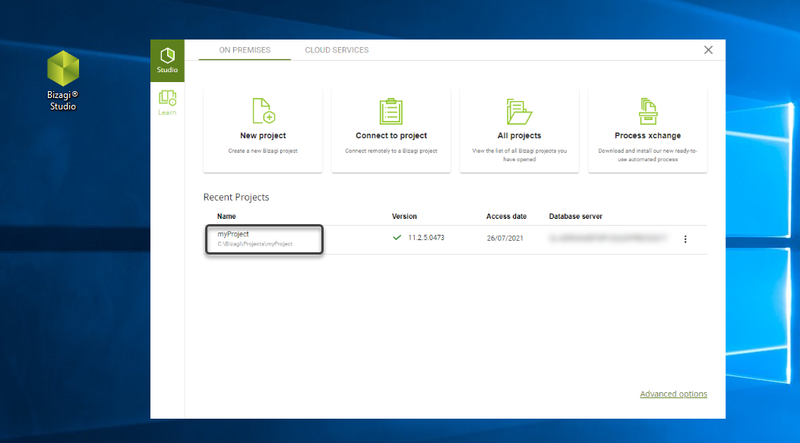 Notice this option lists services being accessed by Bizagi devices, but it allows you to include additional applications that represent granted access to the services by getting appropriate access keys. 2.2 Add a new application. Note that for the default and system settings, you may only choose to edit the token's lifetime, which determines a number of minutes after which a token expires (to enhance the security employed by these tokens, especially regarding replay attacks). •Name: Give a unique and representative name. •Grant type: For this particular scenario (connecting a Client project to a Server project), use Authorization code. •Web Site: Specify the URL of your Client project for descriptive purposes. 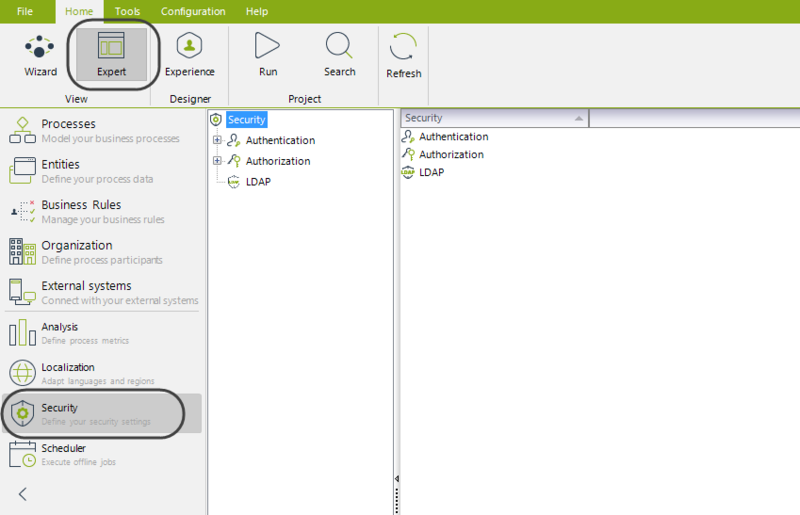 •Allowed Scope: For this particular scenario (connecting a Client project to a Server project), use Login. •Redirect strategy: For this initial test and for a general use, consider setting Web application. •Redirect URI: Define the URL to which there will be directed in the callback once an user inputs his/her credentials. •Token lifetime: Define the number of minutes for which a same token is valid and can be reused for another invocation (usually to enhanced security while avoiding replay attacks). An usual or recommended setting should consider not exceeding 15 minutes. You will notice that your new registered application is listed along with its access keys. 2.3 Copy the access keys once the application is registered. Access keys which will be needed in the next step, are: Client Id and Client Secret. 3.1 Open your Bizagi Studio project. Open Bizagi Studio and load your project (Development environment). 2.2 Go to the security settings. Click on the Expert view, and select the Security module. Click on Authentication in the middle panel, and make sure that the drop-down list at the rightmost panel shows OAuth. Next for the dropdown appearing right below, make sure you select Bizagi. Click Update if you had a different choice before. Defines the Bizagi server URL, for that Server project in charge of authenticating users. Holds the client ID as generated in your Server project's OAuth application. Holds the client secret as generated in your Server project's OAuth application. Enables an automatic token refresh treatment (if set as On), so that users are not prompted to re-enter credentials if the token has expired. Note that through this setting, token expiration is still enforced only that Bizagi will automatically retrieve a new token. Enables a Single Sign-On experience by relying on cookies (if set as On). Defines if users are redirected to a static logout page when they logout. Defines the callback URI after a successful authentication. Defines if authentication errors are shown in a detailed way when they occur. 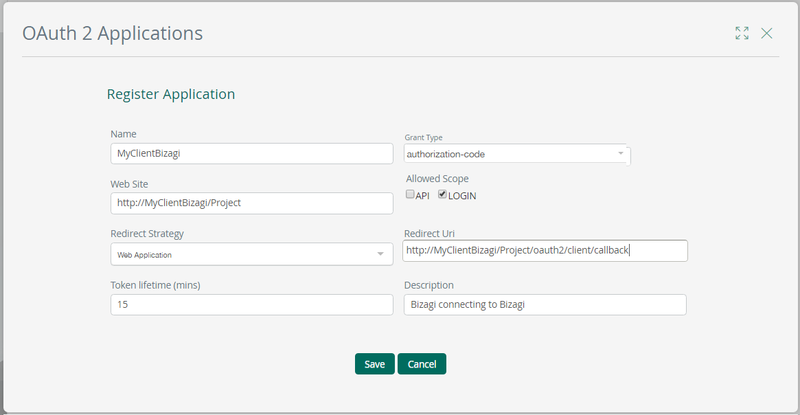 Regardless of the chosen Identity manager, you will always need to synchronize the authorized accounts for Bizagi Work portal (even though for integrated authentication, passwords are not stored in Bizagi when doing so). When synchronizing users with Automation Service, users are uniquely defined by their domain and username combination. oHandles third party authorization requests. oHandles third party token requests. oHandles response codes from an Authorization Server. 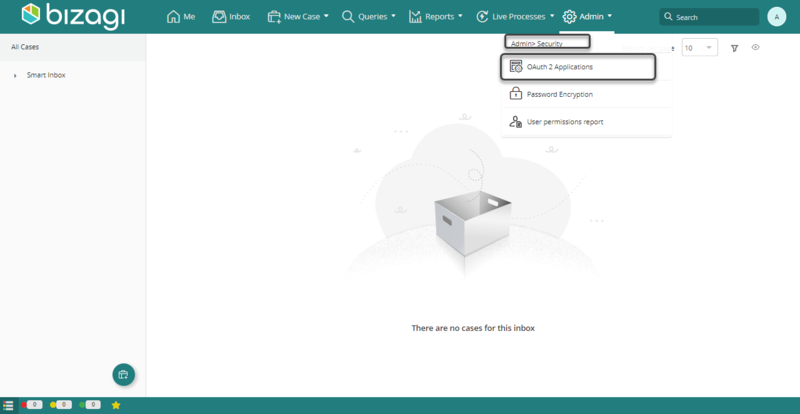 •No error page is shown whenever connectivity fails between the Client project and Server project -especially if nesting more than 1 project under this treatment. •Logs are not recorded with further detail (i.e event viewer). Enable password change after the first login, Idle account duration before lockout, or Password restoring options.